Full-sized scooters are designed for scooter users who want more features and power. The individual pieces of a full-sized scooter are heavier and bulkier than those of a travel scooter, but they are designed for disassembly if needed. 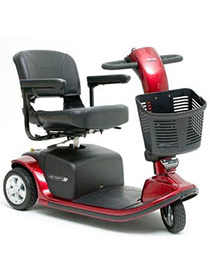 Full-sized scooters have an excellent range of standard features and optional upgrades. When thinking about a full-sized scooter, consider incline rating and ground clearance. This information can be found on the specs tab of the product pages. All-day comfort and many optional upgrades!